Brown the ground beef in a pan. Salt and pepper to taste when finished. Put the cooked ground beef in a large stock pot. Add the water, seasoning pack and butter according to the stuffing package. Bring to a boil. Let boil for a few minutes. Cover then reduce heat and simmer for about 5ish minutes. Add the bread crumb packets and mix well. Cover and remove from heat. Let stand for 5ish minutes. Pour into a greased or Pam sprayed casserole dish. Remove drippings from either a turkey or roast chicken. You can use pre-packaged or powdered chicken broth in a pinch. 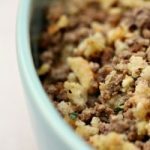 Pour over the stuffing. Drop small bits of butter randomly over the top. Put in a 350 degree oven for about 20 to 30 minutes, stirring at least once during the cooking process. Remove and fluff with a fork. Transfer to a serving bowl. Serve with a big old cheating smile!